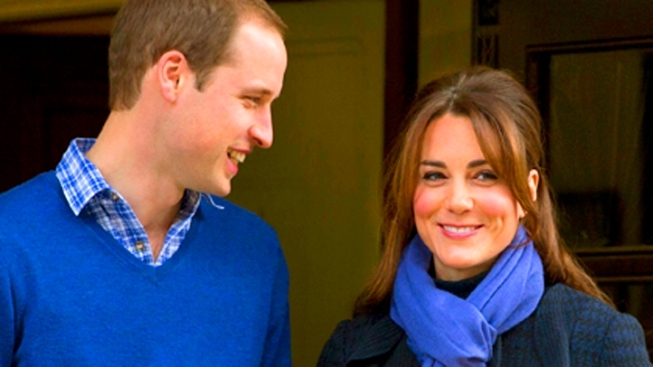 Prince William reportedly suggested that morning sickness be called "all day and night sickness." Britain's Prince William stands next to his wife Kate, Duchess of Cambridge as she leaves the King Edward VII hospital in central London, Thursday, Dec. 6, 2012. Prince William and his wife Kate are expecting their first child, and the Duchess of Cambridge was admitted to hospital suffering from a severe form of morning sickness in the early stages of her pregnancy. Kate has come down with another bout of acute morning sickness, just days after the Duchess checked out of King Edward VII hospital. While the Duchess of Cambridge won't be heading back to the hospital this time, Prince William reportedly canceled his appearance at the British Military Tournament Sunday to be by her side at Kensington Palace as she recovers, according to Us Weekly. "It is well known that Hyperemesis Gravidarum often recurs," a St. James Palace spokesman told the mag, using the medical term for this type of morning sickness. Saturday, Prince William commented about his wife's health to former Centrepoint chariman Michael O'Higgins at the Winter Whites Gala, saying "I don't know why they call it morning sickness--they should call it all day and all night sickness. It's a long old process but she is getting there. She feels like it is going to go on forever," according to Gossip Cop. After announcing her pregnancy Monday, Kate was admitted to the UK hospital for treatment for this acute form of morning sickness and was released Thursday.